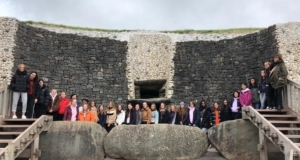 5th and 6th Year Art students travelled to the Boyne Valley on Wednesday, Oct 3rd as part of their research into prehistoric art in Ireland. They visited the megalithic passage grave of Newgrange and were excellently guided through the artistic features of the site. They were very fortunate to receive a double session in the central chamber and experience a complete simulation of the chamber lighting up. Thank you to the Office of Public Works staff who facilitated the trip. It was a great experience for the girls and will benefit them greatly in preparation for their Art History and Appreciation exam.